Apart from special events, we are open to the public every Monday, Wednesday, and Friday from 1PM to 4PM (except holidays). You may also E-mail us at admin@northtexashistory.org to request a special visit if you are interested in our organization and its efforts, or if you would like to make a donation or volunteer your time in support of our cause. 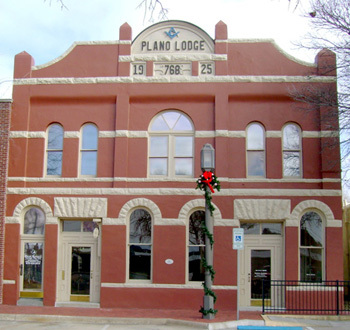 The North Texas Masonic Historical Museum and Library is located in the original area of downtown Plano, Texas, on the first floor of the Plano Masonic Lodge. Take the 15th Street Exit from U.S. Highway 75 (North Central Expressway) and proceed East on 15th Street. Immediately past the railroad tracks, turn right (South) onto J Avenue (parking area). The Museum and Library is on the left, facing the railroad tracks.